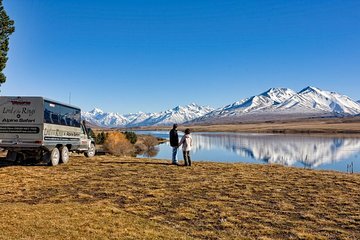 Visit Edoras of ‘The Lord of the Rings’ fame on this full-day excursion by 4WD vehicle to the peak of New Zealand’s Mt Sunday. Get a look at exclusive photos of Edoras under construction and learn from a knowledgeable LOTR guide about its transformation from tranquil countryside to mythical capital city of the Rohan people. Pose with replica props from the popular trilogy, such as Aragorn’s sword, Gimli’s axe and the flag of Rohan. Includes round-trip hotel transport from Christchurch plus a picnic lunch with sparkling wine. L’excursion d’une journée Le Seigneur des Anneaux dans le village fictif d’Edoras, dans la région de Canterbury, en Nouvelle-Zélande, commence par le ramassage le matin à votre hôtel. Montez à bord du véhicule 4x4 pour vous rendre à Mont Sunday, mieux connu des fans de LOTR par le nom d'Edoras - la capitale du Rohan et le foyer de Meduseld, la salle du roi Theoden. Vous rencontrerez des terrains rocheux et traverserez d’étroits ruisseaux avant de vous rendre à Edoras. À votre arrivée sur le site du film, suivez les traces de la noble dame Eowyn et admirez le sommet offrant une vue à 360 degrés sur les lacs alpins, les sommets des montagnes et les hautes terres agricoles en contrebas. Votre guide partage des photos d'arrière-scènes d'Edoras en construction et indique des caractéristiques géographiques importantes de la Terre du Milieu, notamment les Monts Brumeux, la rivière Snowbourn et la vallée de Harrowdale, à l'opposé de l'imposant Helms Deep. Découvrez pourquoi ce site a été sélectionné par le réalisateur Peter Jackson pour la trilogie Le Seigneur des Anneaux. Savourez un pique-nique (voir l’itinéraire pour un exemple de menu) avec un verre de vin mousseux et posez-vous pour des photos avec des accessoires tels que le drapeau de Rohan, la hache de Gimli, l’épée d’Aragorn ou le roi Theoden. Puis, retournez dans votre véhicule 4x4 pour rejoindre votre hôtel à Christchurch, où se termine votre excursion à Edoras. • Un verre de vin mousseuxVeuillez indiquer vos préférences alimentaires au moment de la réservation. Great tour even if one's not a fan of LOTR. The scenery is simply breathtaking and worth the trip. The tour guide Maria was very knowledgeable and an awesome companion for the trip. Highly recommended. This tour was incredible! As a Lord of the Rings fan it was a fantastic experience! The tour guide was knowledgeable and fun. While it was a long drive they stopped as needed and played behind the scenes videos etc. to keep us entertained for the drive. Once at Mt. Sunday we were driven on to the mountain and did a small walk up to the top for an incredible photo opportunity and time to explore. However, be prepared for strong winds while on top. 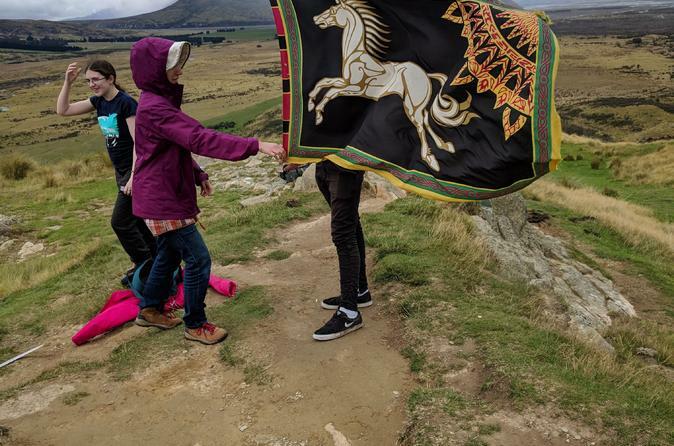 We took the Journey to Edoras tour on April 1. The weather was clear and still, our guide was friendly, and we had beautiful views of Mount Sunday and the surrounding valley. Our guide had pictures of what it looked like when they filmed, and you could be forgiven for expecting a troop of horsemen to come across the plain. Lots of time for pictures on the hill, and a nice lunch, too. We even met a herd of curious goats along the way. Recommended for both LOTR fans and anyone who wants to see some stunning scenery. Great fun and the guides sure know their stuff to keep you safe. even though it started out raining we had a great day. Mike was a wonderful guide. Long ride but the destination was worth it. The Edoras is hard to drive to so a tour is definitely a better option. When I booked the tour I had the doubt if it might be worth it but after the whole day I’d say it is definitely worthwhile. Very helpful and friendly driver and tour guide contributed to a very organised day trip. This was a brilliant tour, well worth the money and I would definitely recommend it to anyone who is staying in Christchurch. The tour guide was informative and entertaining, including everyone in the tour and full of interesting information. He had lots of information about the places we were seeing as well as New Zealand as a whole. To be able to stand on top of Mt Sunday, especially with the snow creating a winter wonderland effect, was excellent. This tour made my holiday and I would definitely look at similar tours in the future.